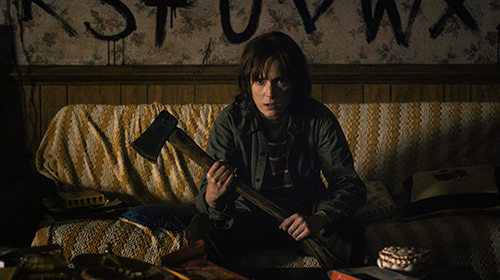 Next month’s premieres include Stranger Things (above), French and British police dramas, the return of Marco Polo and box sets of Gilmore Girls and Father Ted. Set in contemporary London and starring Anna Friel, Marcella, from screenwriter and novelist Hans Rosenfeldt (The Bridge), centres on the psychological struggles of a Metropolitan police officer at a crisis point in her personal life. After a mysterious disease kills every resident over 22 years old, survivors of a town must fend for themselves when the government quarantines them. This epic historical drama continues the story of the 13th century explorer’s service in the court of legendary emperor Kublai Khan. Jim Jefferies’ second Netflix special unleashes his signature, unapologetic take on topics that range from personal and fatherhood stories to political and social commentary about religion, freedom and even Bill Cosby. BoJack is certain he’s on the comeback trail as he promotes his starring turn in the film biography of Secretariat, the legendary racehorse. Despite the Oscar buzz surrounding the movie, BoJack worries about his artistic legacy. Degrassi: Next Class is a pull-no-punches dramatic series that tackles the real-life issues of high school students. Telling the stories of Generation Z, the series focuses on a group of teens as they begin their journey into adulthood. With the killer revealed at the end of last season, don’t be fooled into believing the mystery has been solved or that more blood won’t spill at Lakewood High. As the second season opens, the hunt is on for the killer’s partner. Follows what happens when 2500 strangers converge in hopes of finding deeper connections with others and within themselves. Throughout Joe (Metallica: Some Kind of Monster, Crude, Paradise Lost) Berlinger’s the film, viewers get front row seats to Robbins’ life altering and revealing one-on-one “interventions” with attendees; his inspired and confidence building group exercises; and behind-the-scenes looks at how the enormous event comes together. Elite athletes in tough life circumstances struggle to keep up the pace on a champion community college football team in this documentary series. Set in Bangalore in the 1980s, Brahman Naman follows the exploits of a quick witted, high school quiz champ who leads his hopelessly nerdy friends on a trip to Calcutta to win a major college prize. Young, smart and full of heart, the trio are determined to win the quiz – and to lose their virginity along the way. Long-lost buddy Zack gets suburban dad Kyle on a bus to a Rebirth seminar, sending him down a rabbit hole of psychodrama, seduction and violence. A vocabulary building show from The Jim Henson Company that follows four adorable baby animals as they sing, dance and play. Ground-breaking Henson Digital Puppetry Studio, a proprietary technology from Jim Henson’s Creature Shop, allows puppeteers to perform digitally animated characters in real time – enabling the animation to be more lifelike and spontaneous. Finds the world’s most famous feline fortune-hunter in the hidden city of San Lorenzo, a mythical land that is invisible to the outside world thanks to a magical spell that protects its quirky inhabitants – not to mention its wondrous treasure. When Puss in Boots accidentally breaks the spell, he must do more than fight off an endless legion of invaders and marauders … he must become a legend. A high-energy comedy series about an amazing species of creatures that can pop into and out of a ball. Six legendary heroes find themselves on an epic quest as they harness the power of nature’s elements to defeat the forces of evil. A misfit alien named Oh moves in with Tip and her family, in a series that picks up the dynamic duo’s adventures where the hit film left off. A mysterious relic is discovered during the construction of a dam. To study the artefact, the United Nations Kurobe Research Institute is established. Scholars from all over the world gather here, their children attending Tateyama International High School. Among them is the Institute Director’s daughter, Yukina Shirahane. In the summer of 2016, a samurai rises once again. Years before he ascends the throne, Sinbad grows up in a fishing village. After his father dies, his mother asks Yunan to take Sinbad under his wing. Seasons 1-3 were shot in SD but the rest should be in HD and S8, Gilmore Girls: A Year in the Life, will be in 4K or UHD when it premieres in November. Haha. You beat me to it Trevor, I was just going to mention the Star Trek shows. Wonder when they were put on Netflix NZ? Thanks for this, Phil. A handy list! Happy to oblige, Brian. I only wish I could advise which content rights, if any, expire in July. For some inexplicable reason, Netflix NZ/Oz won’t provide those details. I noticed tonight that Californication is now also on Netflix. It was exclusive to Lightbox.